The heart of the home, the place where you cook, dine, and gather as a family. Today we're sharing the kitchen, dining, and laundry room of our Calabasas Remodel. Watch as we bring these spaces to life! We've mentioned this in our previous videos, but when designing a large home with rooms that connect together, we'll pick a color to carry throughout the spaces and bring it all together. 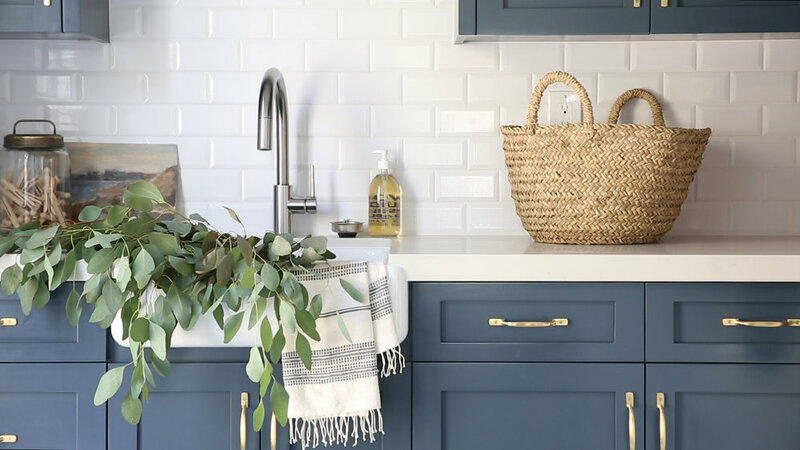 We used Benjamin Moore's Blue Note on the cabinetry in the kitchen and laundry room. We love to use fresh greenery to bring a space to life. This is especially effective in a space where you cook, gather, and spend time in, like a kitchen and dining area. Whether this is florals or fresh produce, it's a detail we never miss. When you have a growing family, you want to keep a space as functional as possible. We made this open space into a sitting desk area, perfect for working while kids do homework at the counter.